Decisions about where to sail is made not based on a modern, satellite-view map of the world, but on the ‘knowledge economy’ carried in every crew member and gained as the ship moves from port to port. This brings participants closer to the cultural reality of how knowledge was built by travel and experience: Odysseus is the mythological paradigm, and ancient sources reflecting the social practices onboard ship are the historical counterpart. Sailors would take on local pilots while moving port to port, and benefit from the access to city councils afforded by proxenia grants ((J. Morton, The Role of the Physical Environment in Ancient Greek Seafaring. Brill 2013)). 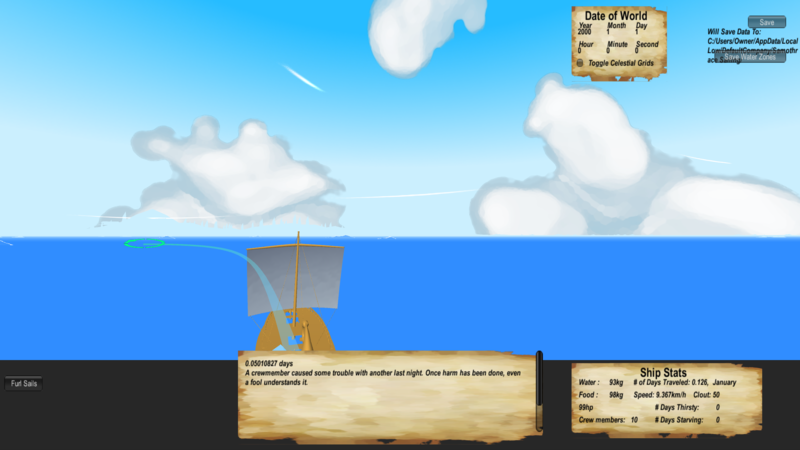 Players will choose their strategies for movement based on the desire to optimize financial, cultural and informational gains, to follow wind and water currents, and to avoid the risks of piracy, storms, and hostile ports. Data on the gains and risks are taken from ancient historical, epigraphic and literary sources and embedded in the system; these appear as ‘pop-up’ windows as the ship moves through space. Individual texts are thus positioned space on the one hand, and combined with other textual sources. The second level of dialogue on the pop-ups are imaginary texts and blogs from the ancient sailors, who had plenty of time on board to have bad dreams, find their fellow sailors irritating, and pontificate on human nature, in tones appropriate for the ancient Mediterranean. Dialogue on the pop-ups are imaginary texts and blogs from the ancient sailors in tones appropriate for the ancient Mediterranean. When the ship comes within a sphere of influence of a port, currently set to 30km from the port, information on that port will appear, providing indications of the economic resources, and gossip and rumor about recent financial or political decisions. 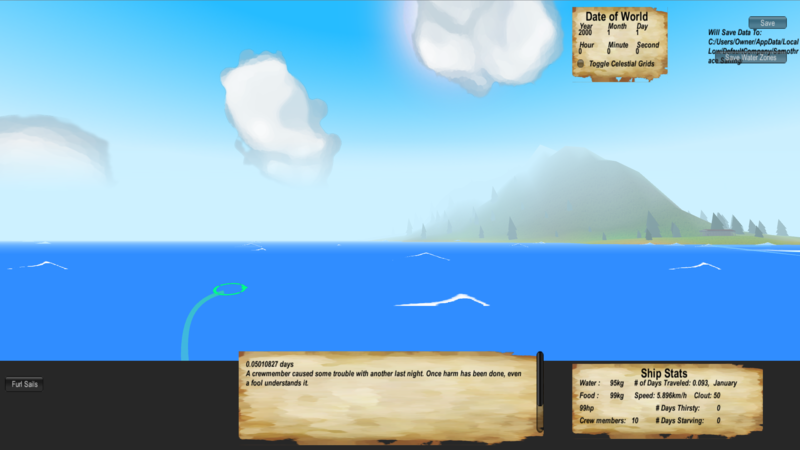 When the player gets within 2km of a port, they have the option of ‘docking’ and interacting with the port. One source of gossip and rumor at the port. Sailors navigate not only through knowledge gained from fellow travelers, but also by the stars and by monuments and shrines erected in the landscape which served to warn sailors of local risks. 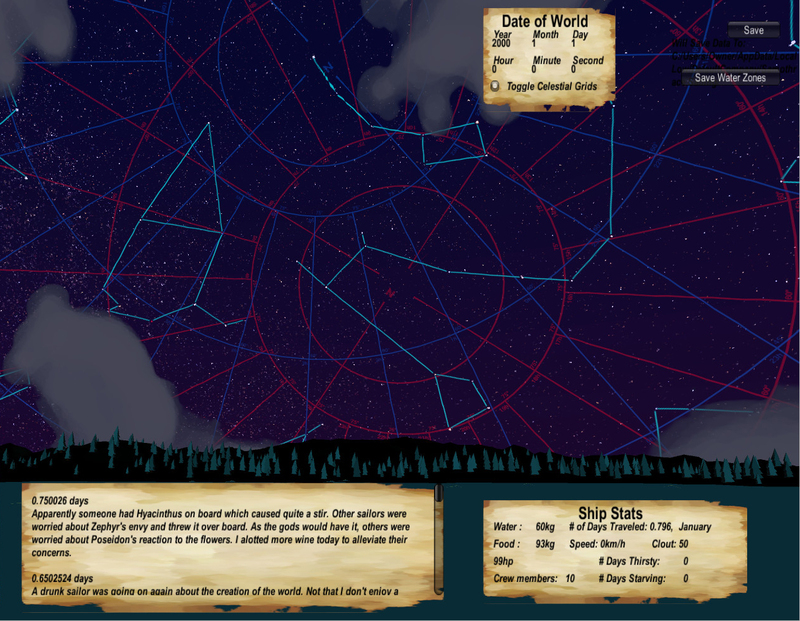 As night falls, the constellations appear overhead; the light blue lines indicate familiar constellations by which the ancient sailors knew their paths. 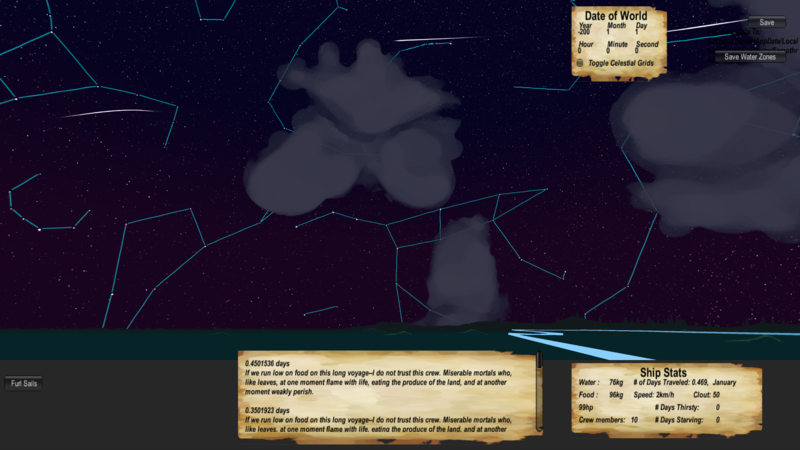 Game players will thus engage with the ancient accounts of how these constellations were used to guide their path. Data on the shrines in the landscape are being collected from Morton 2013 and other sources; data on the stars have come from NASA’s Tycho Catalog Starmap and Deep Star Maps. The movement and placement of stars has been implemented based on an accurate model of axial precession and the alignment of stars in the sky ((The formula for axial precession used is referenced from: N. Capitaine et al 2003. Expressions for IAU 2000 precession quantities. P581. DOI: 10.1051/0004-6361:20031539. The constant term of this speed (5,028.796195 arcseconds per century in above equation) corresponds to one full precession circle in 25,771.57534 years (one full circle of 360 degrees divided with 5,028.796195 arcseconds per century). This formula is an approximation of an incredibly complicated process that does not remain constant. There are subtle interactions between other planetary bodies, such as the moon, that affect the earth’s precession over time. This means the axial rotation of the precession is not always 5,028.796195 arcseconds per century–but it is estimated to be so. It is accurate roughly +-10000 years from the J2000 epoch standard, which covers our time-frame of interest, ~200 BCE. All dates are currently calculated from a proleptic calendar, or one where all dates are seen through the lens of the modern Gregorian calculator’s extension back into time. This will change to reflect Julian Calendar dating, which the humanities use as a standard rather than the proleptic calendar. These dates are then converted into an Astronomical Julian Date (not to be confused with the Julian calendar) for use in the formulas.)). As night falls, the constellations appear overhead. Axial precession is the slow change over centuries of the orientation of the Earth’s axis. In the year 2000 CE the Earth’s north pole is pointing towards the North Star (Polaris), but due to axial precession, in 200 BCE the axial north pole was pointing in a different direction away from Polaris. The implementation of axial procession allows users to follow the stars in their ancient positions. As the next step, the equinoxes and day-night cycles are in the process of being programmed and implemented. The star and constellation maps were taken from NASA’s Tycho Catalog Starmap and Deep Star Maps ((Game design discussion by Robert C. Bryant – Lead Programmer and Simulation Designer.)). The Celestial Grids show the orientation of the North Pole. The capacity to gather the data from each game played means that we will be creating a new database of choices made within these networks in real time, and can compare the evidence for edges, the strategic weight of different nodes, and itineraries taken with the ancient epigraphic and historical records. To see more on nodes, edges, and networks, see the Social Network. This is a significant balance to our analysis of the ancient epigraphic data, whose preservation or destruction was a matter of historical accident. These choices made, most significantly, come from a wide sample of the population – it takes interaction with epigraphic evidence away from academic specialists and into the world of businessmen, self-identified adventurers, and anyone with interest and imagination – players ultimately more like members of the crew of an ancient ship than an academic discipline. These behavioral data will serve as analogs of decision-making in an ancient sea, as players respond to the environmental pressures recreated in the simulation. 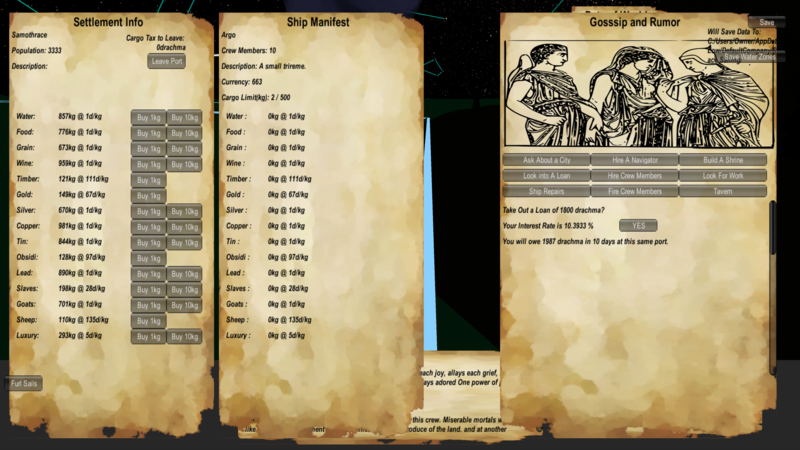 By implementing features that boil the learning-curve of real maritime skills into easy to follow visual and narrative cues, we hope to create an easily accessible experience to players of all backgrounds while retaining a robust behavioral database. The apparently random risks of storms, pirates and other maritime disasters are coming from ancient texts about these events, from Homer’s Odyssey to inscriptions about curses to be called down on citizens who aid pirates. Players thus engage with real historical data, at the same time that they engage their imagination and problem-solving skills. The risks and costs in port are estimated based on the epigraphic record of the benefits of proxeny, which included the ability to sail into and out of port without paying taxes. Players will gain a constant, real-world reminder of how effective these ancient civic structures were. A game that engages with the qualitative and quantitative geospatial perception of antiquity, although not innovative on its own, can be when bolstered with ludic and research data-driven complexity with a primary focus on gathering behavioral data for answering academic research questions. Rather than design a gamified experience that achieves monetary profit through mining marketing behavioral data, we are attempting to design a gamified simulation that pedagogically engages players with an accurate account of the ancient world, while simultaneously using players’ behavior to better understand that same environment.